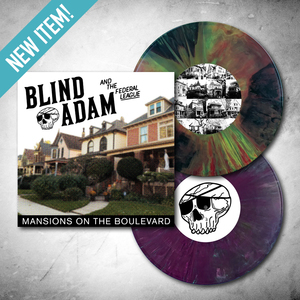 Blind Adam & the Federal League are a Chicago-based punk band comprised of members "Blind" Adam Gogola (vocals/guitar), Alex Simotes (bass/vocals), Josh Kurec (drums/vocals), and Zach Nelson (lead guitar/vocals). The four met during various phases of theircareers in the Midwestern music scene, having respectively played in bands such as The Night Brigade, The Please and Thank Yous, Of Wolves, and Badwater Sound. Their name is a nod to a nickname given to Gogola by his friend Bryan Kienlen of The BouncingSouls during a cross-country motorcycle ride taken shortly after being diagnosed with a degenerative eye condition. That trip spurred Gogola to get back into music himself. After tapping several longtime friends to join him, Blind Adam & the Federal League was born. Known for their country-tinged variety of rock and roll and politically-charged lyrics, Blind Adam & the Federal League draw inspiration from Bruce Springsteen, Rancid, Tom Petty, and Jason Isbell.